I'm excited to say that today's the day!! Another Dose of DIY Inspiration blog hop. Are you ready? 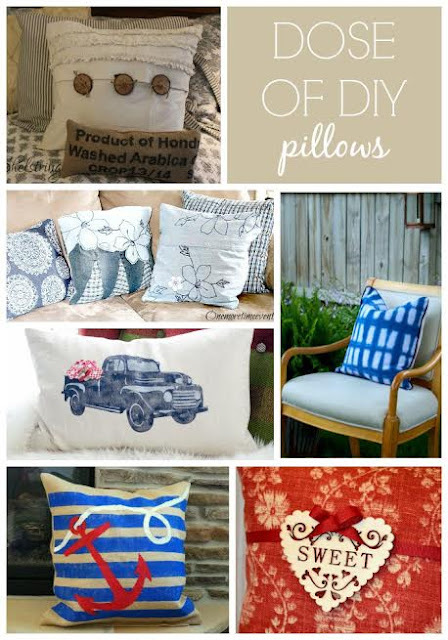 Do you remember last month when we all announced this month's theme was pillows? Well, I have actually been looking forward to this one with great anticipation since I have been wanting to have an excuse to make some pillows for quite some time now. I know...you are probably wondering why I need an excuse, right? Well, if you lived in this household with all it's activities and goings on of 8 people and their friends, it would be quite clear to you. My to do list is MILES long every day. Needless to say that I am not able to get most things on that list done, but as long as the children are fed, happy, and getting along, I've accomplished great things. right? Anyway, as I was saying, this was my opportunity for making some pillows I've had in the works in my head for quite some time. 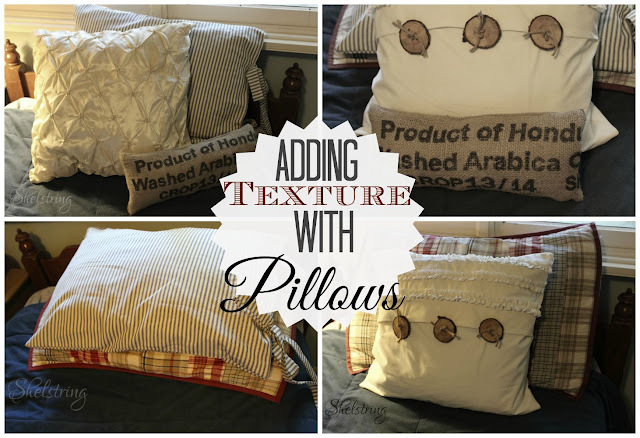 I can't wait to share them with you, but before I do, I want to remind you to hop on over to the other great blogs and see the amazing pillows they made too! 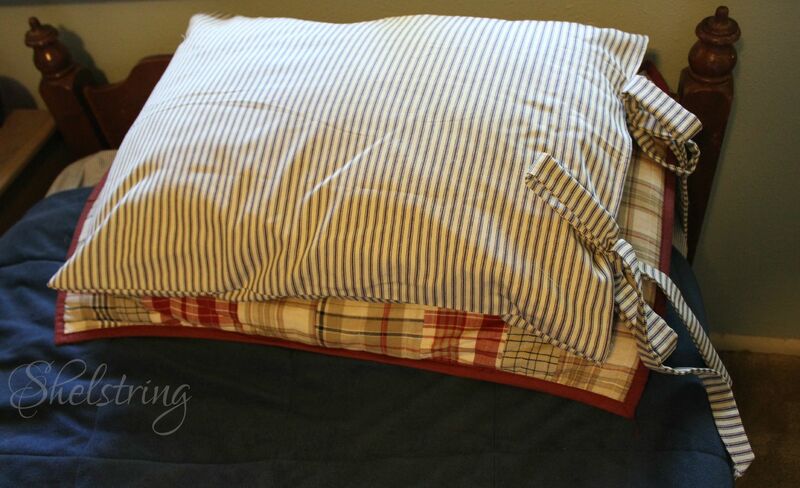 I've had several pillows and forms floating around my house for quite some time. I don't know exactly how or when they start traveling, but for some reason they end up in different parts of the house. In the case this happens, I like to have them neutral and classic. I also think pillows are a great way to add texture into decorating. I think you will find that true with the styles I share with you today. 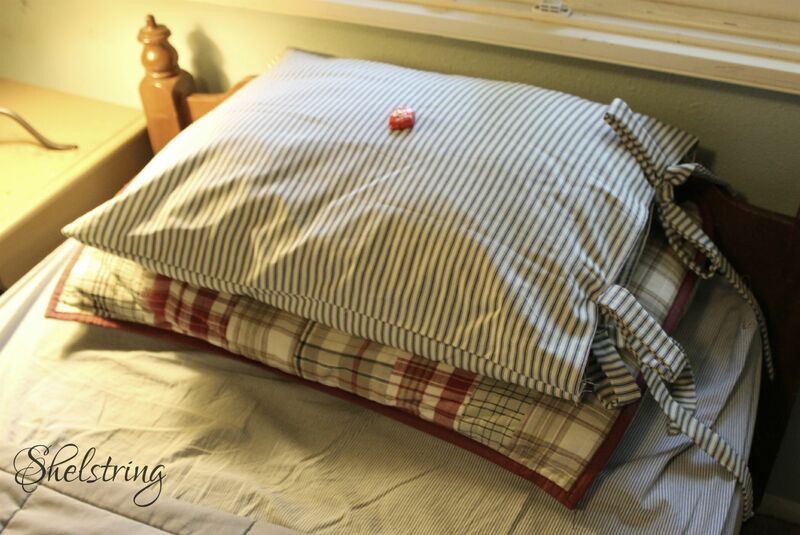 In my long anticipation for making pillows, I ended up coming up with 4. Please don't call me an over-achiever. 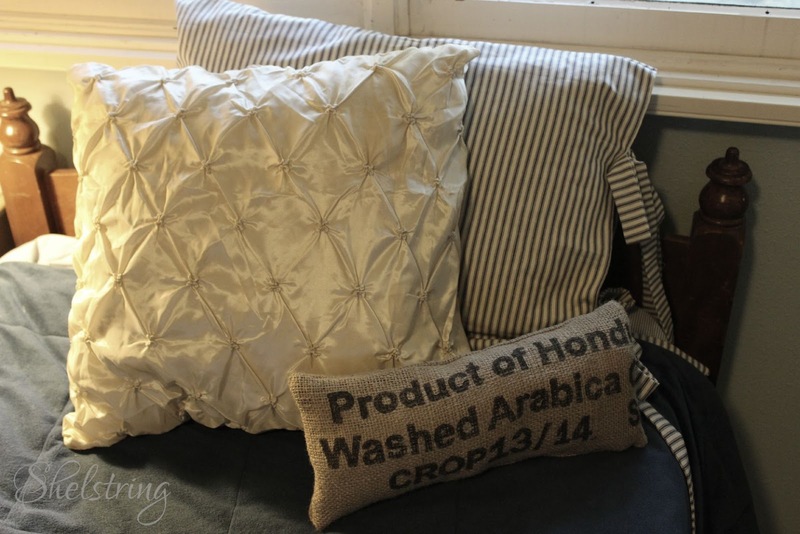 This puckered pillow is the first one that I made with some material I initially intended for curtains in my bedroom that didn't look quite like I'd envisioned in my head. Trust me when I say that it definitely makes a better pillow! This second one was inspired by some pictures I have pinned on my pinterest board. I love pillowcases with ties. It adds such a nice touch and is so practical with children. Sometimes pillow cases seem to come off around here somehow. This is a darling way to add texture, interest, and style while being a great solution to a problem. It was actually quite simple to make and one that I will be repeating in the near future. 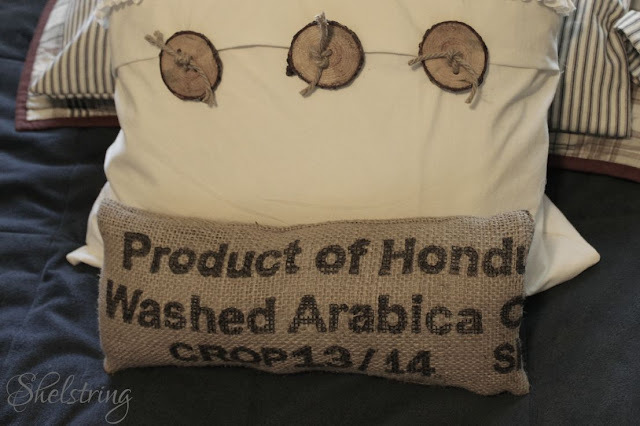 The third pillow was made from the scraps of a coffee sack. The pillow form was given to me years ago in the hospital when I had a serious abdominal surgery and couldn't cough or laugh without hurting. It really made a big difference in easing my pain. I don't know why I can't let it go, might as well make it decorative in the process of keeping it, right? Coffee sacks can be used in many ways to add great style. I love the look of the words and numbers. Last, but not least, is this pillow I made from fabric I got for 50¢ from a yard sale this weekend. It feels like a light canvas or heavy broadcloth. 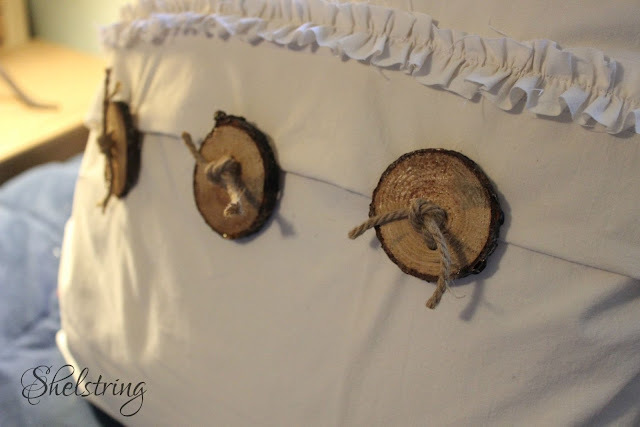 I made it sham style in the front then added wooden buttons I cut from a tree limb in our back yard and polyeurathaned. After drilling two holes, I strung upholstery jute through them and tied them in a knot. The buttons are sewn on and only serve a decorative purpose. 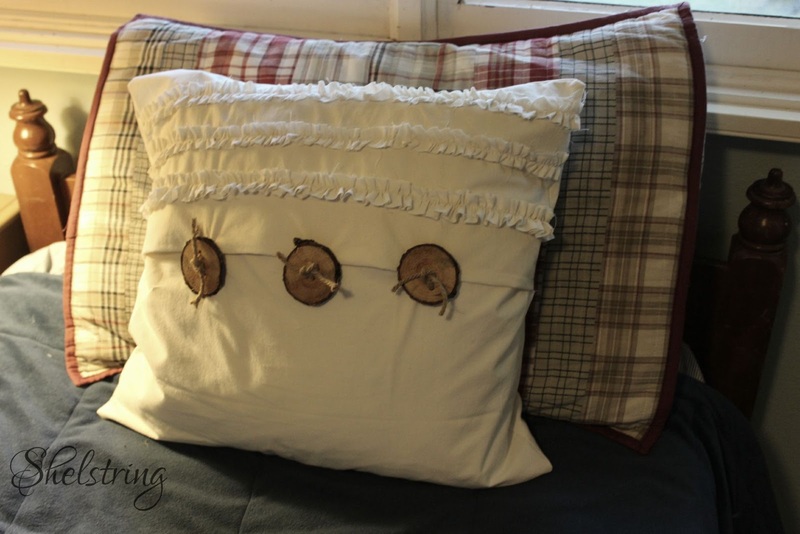 This pillow was the most time consuming with it's ruffles and specially made buttons, but was well worth the time with all the texture and depth it adds to the mix. 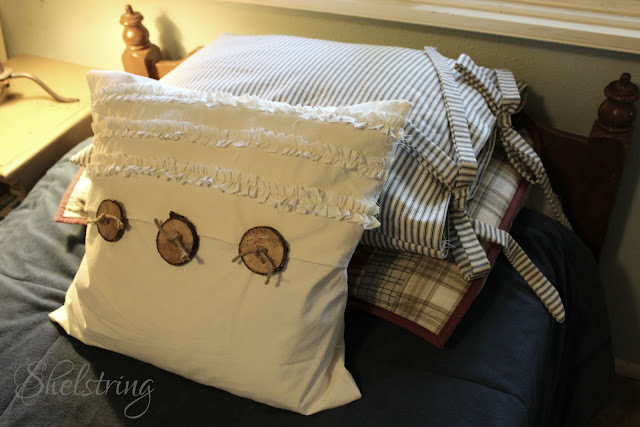 I really love the look of all the pillows together. I think they add such character and style. Though I have my individual favorites, I love them best all together. 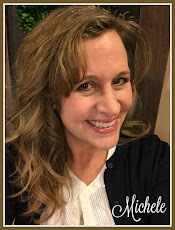 now it's time to head on over and see all these other great ideas! Come back next month for lighting. I'm sure there will be amazing projects you won't want to miss! I love all your pillows, but I am with you the one with the wooden buttons...oh my goodness is it ever adorable! Such a great idea on how to make the wood buttons.... LOVE IT!!!! 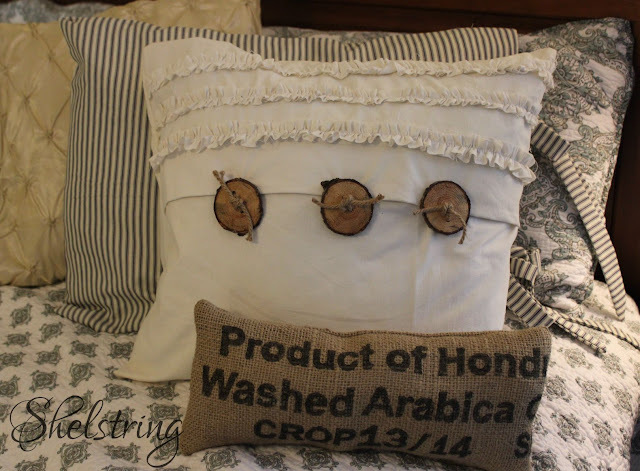 The pillows are all super sweet, but that one with the wooden buttons is divine! I just love the rustic appeal and that it came from your yard! Fabulous! I'm lucky that I could squeak out 1 but you did 4, wow. 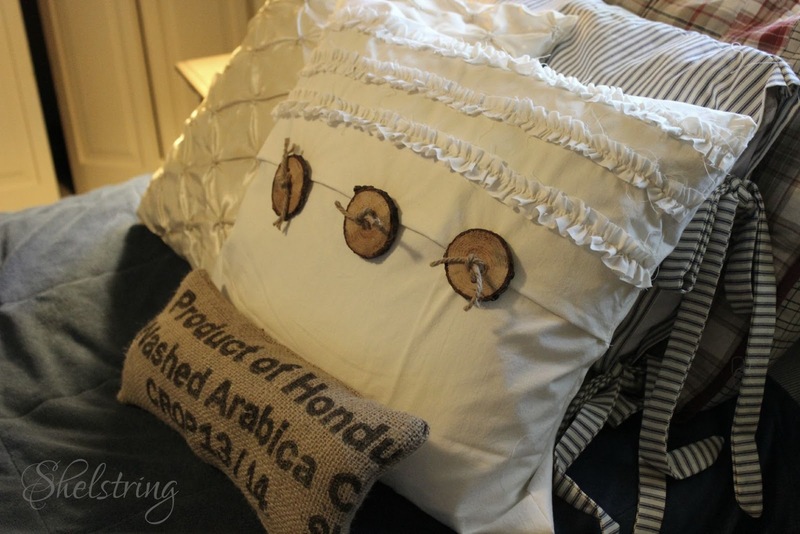 All of your pillows are fabulous but I'm especially loving the one with the ruffles and the wooden buttons. So cute! Love all the great textures you have going on and also the neutral colors. Lovely - all of it! 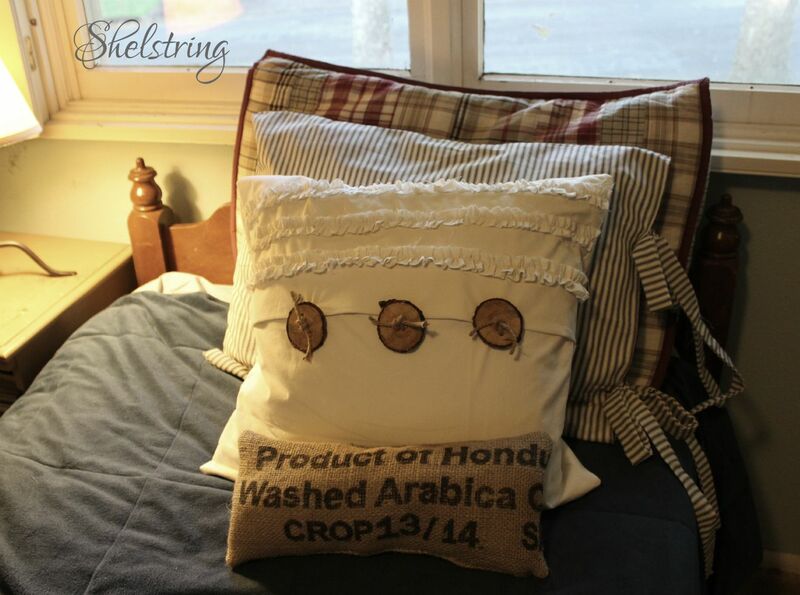 Love all the different textures you combined here, I especially like the little coffee sack pillow.